Twinning was created after the Second World War in an attempt to establish better relations between Britain and Germany. This was later expanded to include other countries. Click here to visit the official European Union Twinning website. Musselburgh Town Council signed a twinning agreement with Champigny-sur-Marne in 1961. They chose Champigny because the Town Clerk's daughter had a pen-friend in Champigny and the two towns seemed similarly situated, each being around 10km from its national capital. In 1983, Musselburgh signed a second agreement with Rosignano Marittimo, which had been twinned with Champigny since 1962. The Twinning Agreements pledge Musselburgh and its twins to establish and maintain friendly relations and, through that friendship, to promote cultural, educational, social, economic, tourist, youth and sporting exchanges between their communities. In the 1974 local government reorganisation, East Lothian Council took over from Musselburgh Town Council as signatory to the Twinning Agreement. East Lothian itself is twinned with the Spree-Neisse District of Germany. Individual towns in East Lothian have a further 5 very active twinning links and 1 sister link. An annual grant from East Lothian Council is the major source of funding for Musselburgh's twinning activities. Click here to find out more about Twinning in East Lothian. In Musselburgh, the Twinning Association provides practical support to achieve the aims of twinning. Its members are people who have experienced the benefits of twinning either personally, or as parents (and in some cases both!) or as teachers. Each autumn, representatives from Musselburgh, Champigny and Rosignano meet to agree a programme of activities for the coming year (see photo). There is a long-standing series of regular exchange visits, as well as one-off projects. Click on the links to see more about each one. In 2016, we took part in the Riding of the Marches celebrations. An annual event, held in March, to celebrate International Women's Day. This was originally held in Rosignano, but Musselburgh has hosted events in 2005 and 2010. An International Youth Camp, which each town's Twinning Committee or Youth/Community Service hosts in turn. The last camp was held in 2009 in Champigny. 'Musicantiere' - a rock concert for youth bands, held each year in Rosignano. Musselburgh band 'Havana Fayre' attended in October, 2007 in the sixth such visit. We hold Walking Weekends together with the Musselburgh group of the Ramblers' Association and groups from Champigny and Rosignano.The last one was in Italy in October, 2010. The last Scottish one was in April, 2010. Twinning Association members also meet occasionally in the summer to play pétanque. The Association is always keen to welcome people with an active interest in twinning. We normally meet in the Brunton Hall, monthly when things are happening and less often when it is quiet. Click here to see the latest calendar of events..
Champigny joined the UN-recognised World Federation of Twinned Towns in 1958. Practical involvement in twinning began with the agreement with Musselburgh in 1961. Agreements with Bernau, in Germany (1962) and Rosignano, Italy (1963) followed soon after. In 1983, a link with Jalapa (Nicaragua) marked a shift in emphasis towards international co-operation and solidarity on a wider front. In 1999, a formal relationship with Camp Al-Fawar, a Palestinian refugee camp on the West Bank, confirmed this trend. In 2008, Champigny twinned with Alpiarça, Portugal. The Twinning Committee sees its role as opening up opportunities for the citizens of Champigny to be active on the international stage. The executive committee is supported by around 150 ordinary members. Alternating annual visits between Musselburgh Burgh Primary School and Ecole Marcel Cachin, Champigny, from 1996 to 2003. Hosting the International Youth Camp, one year in three. The 2009 Camp was held in Champigny. In 2002, when there was no International Youth Camp, Champigny arranged for a group of young people from previous camps to visit Jalapa, Nicaragua. They helped in field schools, funded by Champigny, which educate children who cannot afford to go to normal school. 2 young people from Musselburgh took part. 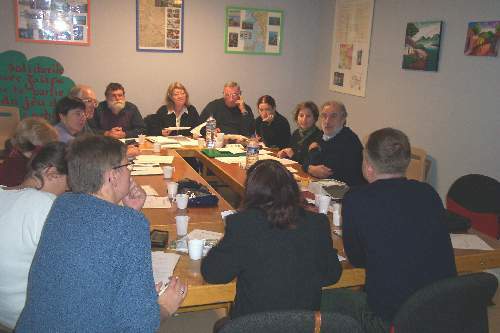 In November 2003, Champigny celebrated 40 years of twinning by inviting guests from all its twin towns. The Provost of East Lothian, councillors and representatives of Musselburgh Twinning Association attended discussions on twinning and its contribution to european and world peace. Rosignano twinned with Champigny in 1962, then in 1963 with Pardubice, in the Czech Republic, and in 1983 with Musselburgh. More recently, they have forged a link with Zug, a settlement of the Saharawi people in the Western Sahara. There is an active Twinning Committee and a twinning association with around 250 members. Activities are concentrated on developing international understanding amongst young people aged 17-25. The International Youth Camp, one year in three.